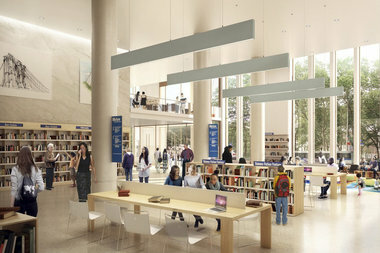 A rendering of the proposed library's interior. BROOKLYN HEIGHTS — Supporters and detractors of the proposed redevelopment of the Brooklyn Heights Library spoke out at a public hearing Tuesday as the city prepares to vote on the controversial project. The City Planning Commission listened to comments from community members and the team behind the project that would bring condos and a new library to 280 Cadman Plaza West as part of the Uniform Land Use Review Procedure (ULURP). The public hearing comes less than two weeks after Borough President Eric Adams conditionally opposed the project and listed a slew of recommendations, including permanent affordable housing and space for a local school. Since Adams spoke against the application, the commission will need nine affirmative votes for the process to move forward. They are expected to vote between late October and early November. The plan will then be reviewed by the City Council. In July, Community Board 2 approved the $52 million sale of the Brooklyn Heights branch to Hudson Companies despite heavy community opposition. The private developer, along with Marvel Architects, plans to replace the existing building with a new 21,500 square-foot library and 139 condo units on top of it. The new branch would be sold back to the city for $1 and the developer would continue to maintain the library's HVAC system, relieving some operating costs. When the commission questioned whether this was the best possible financial deal for BPL, library trustee Michael Liburg said, "I think it is the best deal that could be negotiated at the time." Brooklyn Public Library has said the system currently faces $300 million in unmet capital needs, some of which will be alleviated with the funds from the Brooklyn Heights branch's sale. “This is an opportunity to come up with a meaningful chunk of what our borough system of public libraries need,” Councilman Brad Lander said at the hearing. The private developer has also committed to building 114 off-site affordable units. At the Tuesday hearing, detractors repeated some long-standing local concerns — the use of public land for private development, further overcrowding in the area and a perceived loss of space in the proposed new branch. But the proposal also drew supporters, including Rachel Tiemann, who works at the children's library at the Brooklyn Heights branch. Tiemann said the staff and residents deserved a state-of-the-art center with technological advancements and new infrastructure. "Brooklyn's libraries don't want to just catch up. They want to help lead the way," she said.